As you know, one of the CSL teams was just back from the Saguenay region of Quebec (see post below). The region is well known for their production of blueberries. In fact blueberries are so much a part of the revion, that the people from this region refer to themselves as "blueberries". Everyone was all abuzz about the "peres trappistes" chocolate covered blueberries, which we have been enjoying addictively since we received them. They burst in your mouth with the juice of the berry exploding, and a crunchy chocolate exterior (one must keep the little bites refrigerated). We also have been enjoying the raspberry and the blueberry salad dressing from Domaine Le Cageot. A refreshing sweet, mildly tangy dressing has been the favourite topping for some staffers' salads, coleslaw's and even marinades. Please excuse the empty bottle pictures above it was consumed in less than 5 days - leaving no time for picture taking. Needless to say, we can't wait for our next excursion to Quebec!! One of the many delicious desserts while on our trip. Other highlights included our meal at Auberge Pachon, Hotel Universel in Alma (pictured above) and of course the boundless blueberry tarts, chocolates, and sauces. spooooooky. A real ghost town located in Val-Jalbert. We slept the night in this abandoned town; need we say our night was a touch scary, though the newly refurbished rooms are quite calming. Olivier pours a cocktail at Hotel de cepal. 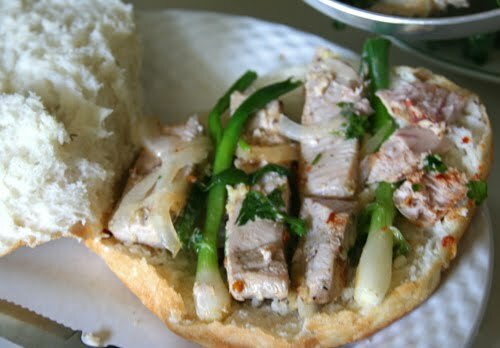 Both Eric and Olivier were fantastically hospitable during our dinner and breakfast; great guys. Chef Marcel Bouchard, a Quebec sensation and fine chef. We enjoyed a personal lesson for smoked trout with beurre blanc and roasted beets. This chef is an absolute teddy bear and lovely man. A spectacular performance at Nouvelle France. The show featured many animals including Farfelou (the sheepdog) and very well trained horses. The acrobatics, juggling and skill of the performers was astounding and very entertaining. Baie St. Catherine; a whale watching mecca. On our whale excursion, we were fortunate to see Minky whales, Humpbacks and even a beluga. One of the most fun ways to explore the mountains; dune buggy. Jerome from Horizon Evasion took us on the backroads for some truly glorious views. The beautiful flora from the Fjord de L'Anse St. Jean. The view from the Fjord; stunning. On our week long journey to the East of Canada, we experienced the beauty of Quebec's Saguenay/ Lac St. Jean region. Charming Auberges, delectible cuisine, amazingly warm and friendly people made this trip absolutely unforgettable. The unspoiled nature in this part of Canada is awe-inspiring, and the smell of pine and fresh lakes still permeates. We can't wait for a return trip. 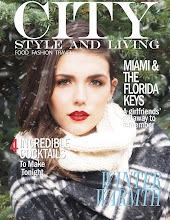 Look for the article in the Spring 2011 issue of City Style and Living magazine. Don't miss it! On September 21, 2010 the world-renowned Canadian Tenors will join forces with the Calgary Philharmonic Orchestra, Tommy Banks and other musical guests for one night only in what is certain to be a must-attend concert - Music in Motion. Proceeds from Music in Motion will be used to purchase equipment for the Advanced Diagnostics and Therapeutics Unit of the McCaig Institute for Bone and Joint Health. This equipment will provide Albertans with state-of-the-art diagnostic capabilities and the advantage of early, economical and effective diagnosis and treatment of arthritis and related rheumatic diseases. Tickets are now on sale at tickets.epcorcentre.org or call 403-294-9494. Nassau to be exact. 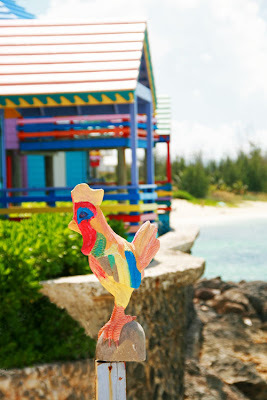 One CSL team enjoyed a breezy, colourful time at Compass Point Beach Resort. 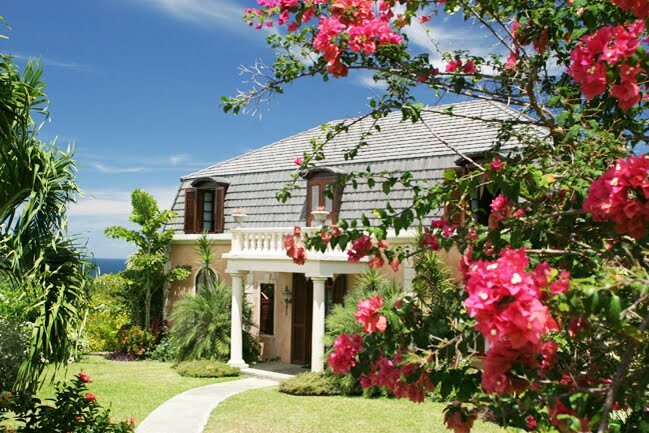 Just minutes from the airport on the Western side of New Providence (in Gambier), the hotel is well known for its spectacular sunsets. Under new management the hotel is staying true to its musical past (it has long been associated with musicians and boasts a recording studio nearby) while updating its laid back vibe. 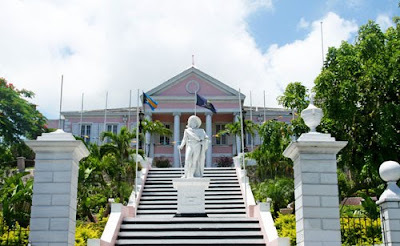 A pastel pink colonial building with a statue of Christopher Columbus greets visitors in Nassau. 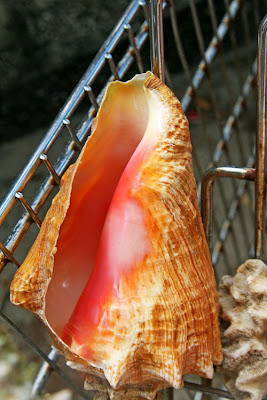 The islands are noted for their conch (tasty in a conch salad). 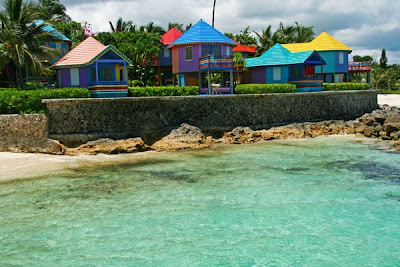 The beautiful acqua waters in front of Compass Point are home to several species of fish. Our team enjoyed calm waters every single day of their stay. "Just looking at the water rejuvenates your soul," said one CSL staffer. 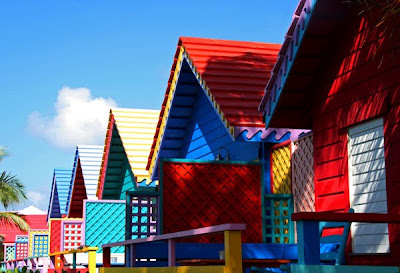 The hotel's buildings are painted in vibrant primary colours. A rooster stands atop the outdoor shower near the hotel's dock. 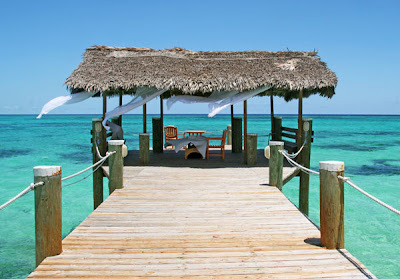 The hotel's dock is serene and floats above the water. At night diners can request to have their meals on the dock, when blue lights emerge from the water. 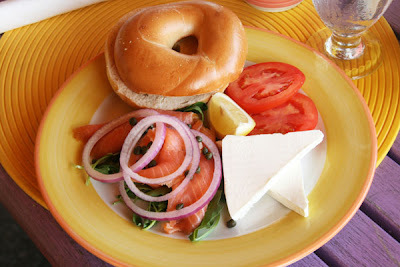 A breakfast time meal of lox and bagel. The spectacular views of the ocean while eating are just another inducement. 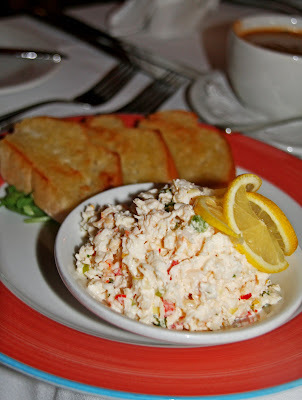 A lobster salad on toast from the dinner time appetizer menu. 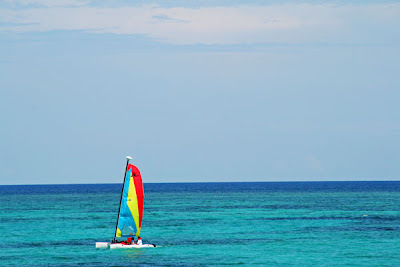 One day a sailboat drifted by our room, its colourful sail echoing the colours of the hotel. 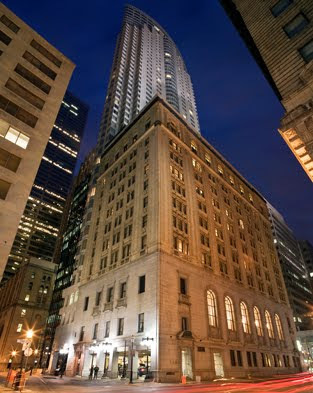 A quick stop in Toronto had one CSL team experiencing the beautiful setting at One King West. 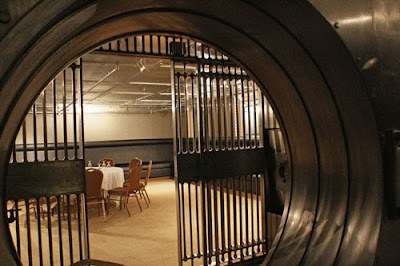 The hotel, a former bank, has beautiful details including a show stopper bank vault (now used as meeting and event space). 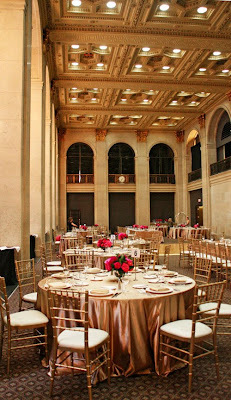 When our team was there the hotel was preparing for a number of weddings and the bank's main floor space was bedecked in golds and pinks. 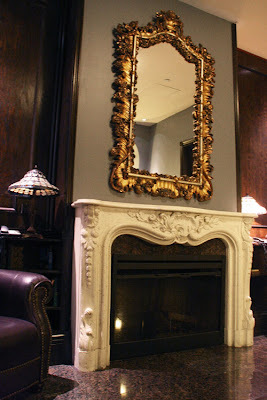 A grand fireplace in the old bank. A brand new tower is also part of the hotel/residence concept.